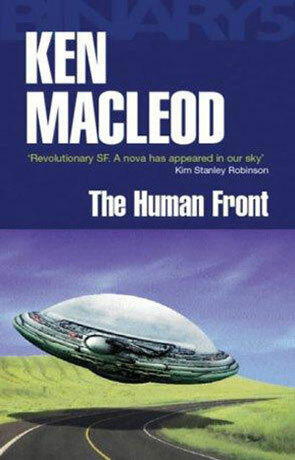 The Human Front is a science fiction novel by Ken Mcleod. I read this after finishing the Engines of Light series, and to be honest didn't expect a whole lot from it, especially after finding out that it was only 90 pages long... but to my pleasent surprise, my inital views were nothing to go by. This is, as you know, a very short book, and as a result the characters are not important. The story on the other hand, is. I wouldn't feel right rating this section as Macleod clearly didn't intend for it to change the readers view on the book. This is an account of an alternate reality, where World War II doesn't end until 1963. Shortly after, a flying saucer crashes into a military base and is only witnessed by a handfull of people. The question that will remain on everybody's mind is not regarding the saucer itself, but the pilot inside. Fingers are immediately pointed in all directions, and soon International Relations are falling apart. I found this book extremely interesting and although it's not Macleod's best, I would confidently recommend it to any Sci-Fi fan. A short read, but well worth it! Written on 27th July 2005 by TC.